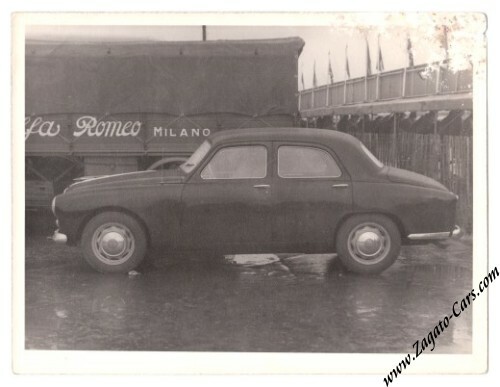 Vintage 1951 Photo Alfa Romeo 1900 Berlina Giuseppe Farina at Monza. This is a vintage 1951 photo of the Alfa Romeo 1900 TI Berlina of F1 World Champion Nino Farina, parked in the paddock of the Autodromo di Monza during the 1951 Italian Grand Prix in which Farina was to drive an Alfa Romeo 159. The photo measures some 21.5 x 16 cm or 8.5 x 6.5 inches. Good condition but slight damage to the top right corner.